Slatwall displays have been around since the beginning of time. They are one of the most widely used types of retail fixtures in the industry. Go to any store, and chances are you will see a slatwall display. Slatwall displays are popular because of their versatility. They make excellent freestanding displays. Slatwall can be a good merchandising solution for walls. Slatwall displays can even be used on the countertop. But, just because they have been around for a long time and are common at retail doesn’t mean your slatwall display has to be boring. On the contrary, if you apply a little creativity to a slatwall display, you’d be surprised at how a boring slatwall display can be transformed into an attractive, eye-catching POP display that can help you increase product sales. Today’s post is the first in a 4-part series focused on creative merchandising applications for slatwall. Over the course of this series, we’ll share over 25 examples of how slatwall can be dressed up to be made more interesting and effective as a merchandising vehicle. We’ll cover our first 6 examples in today’s blog. Our first example is a creative 2-sided slatwall merchandiser we made for Blowfish. Slatwall is typically made of MDF and most often has a melamine or a laminate finish. However, in the picture below you can see how we applied graphics to the slatwall to create a unique fixture. In this case we applied vinyl graphics, but we also could have direct printed the graphics. For this type of application, you can also use relocatable vinyl graphics (with a low tack adhesive) so the graphics can be easily changed out without having to replace the fixture. 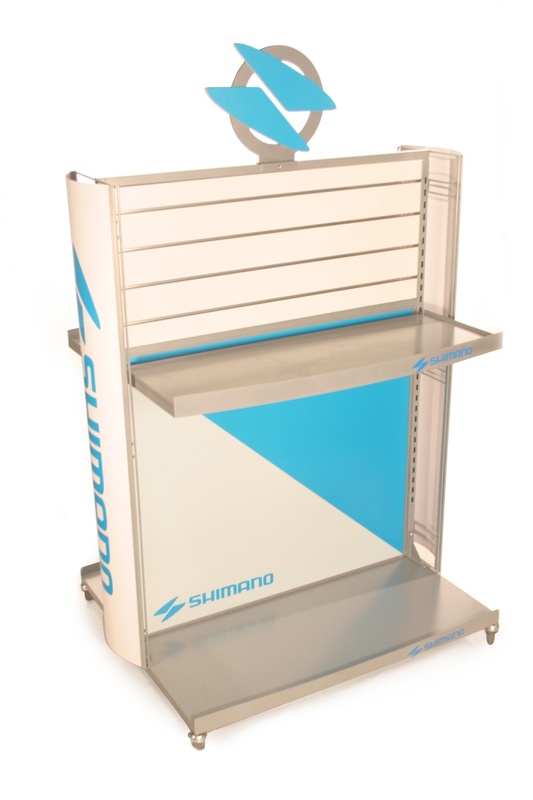 Our second example is 2-sided slatwall merchandiser for Shimano. This is really a combo display that uses slatwall as a central feature but also incorporates a branded sheet metal base on casters, a branded sheet metal shelf, bottom panel vinyl graphics, contoured PVC side panel graphics, and an artistic sheet metal header. This is a highly functional display that is definitely out-of-the-ordinary as far as slatwall fixtures go. 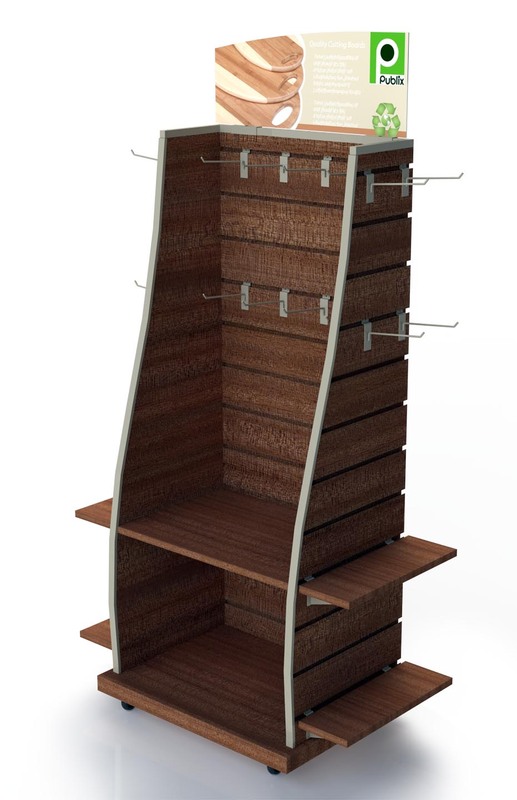 Next is a more traditional freestanding slatwall fixture we designed for ICU Eyewear. We designed this slatwall display to have a main slatwall panel but also side slatwall panels. To get the product off the floor, we designed a matching MDF base which could easily have been configured to include a pull-out drawer for overstock product. We incorporated a mirror at the top of the main panel on both sides, which is an important design element in any eyewear fixture. We finished the display with a screen-printed acrylic header. 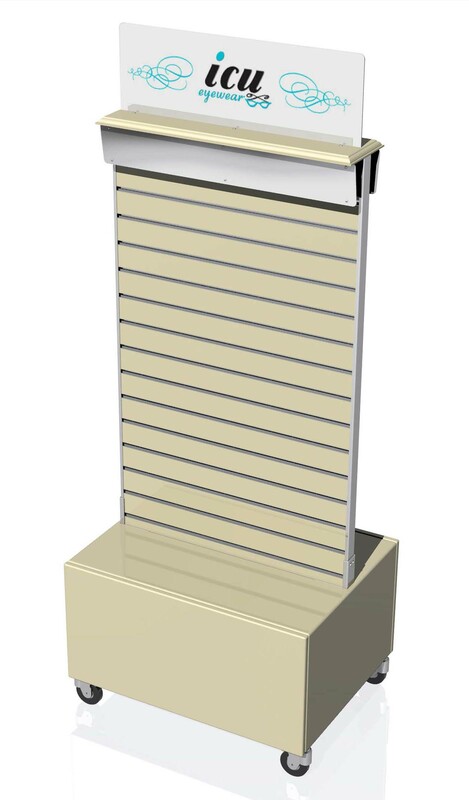 Our fourth example is a slatwall display we designed for a merchandising program for Publix. We created this 4-sided display by using slatwall on the center panel and on the sides. What helped to make this slatwall merchandiser more interesting was the curved sides. The color we selected for the slatwall along with the contrasting edge banding also helped to create a premium look. We used a combination of hooks on the upper part of the fixture and shelves on the lower part of the fixture. We added a simple die-cut PVC header sign to ensure the brand was easy to see. The display shown below is also relatively unique as slatwall fixtures go. We started with a maple melamine MDF base with radiused corners and then designed a matching main panel frame to encase a gray slatwall panel. We designed branded shoe shelves and added side signs with an auxiliary PVC flag sign on 1 side. We also incorporated a framed MDF header with radiused corners and a recessed 2-sided sign. Our final example today is a customized version of our SW-62FL stock 2-sided slatwall display. 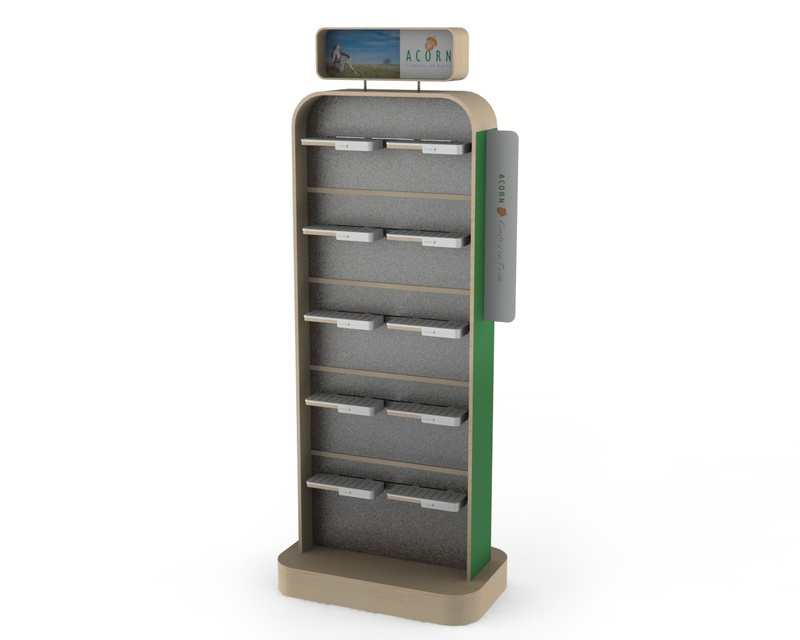 We created this mobile merchandiser for Scosche’s line of electronic fitness accessories. The black slatwall panel is framed in aluminum and includes an MDF base with wheels. The display includes a hanging Scosche glorifier, scanner hooks, shelves, a sheet metal basket on the back side, and an acrylic header with a changeable graphic. This display is a good example of how easy it is to customize a stock display and also how versatile a slatwall merchandiser can be. That’s it for today. Stay tuned for Part II of this series on slatwall displays.